Yes, you too have fallen short of Heaven because of your sin. You may be better than many others, but compared to Jesus "there is none that doeth good." Romans 3:12 "They are all gone out of the way, they are together become unprofitable, there is none that doeth good, no, not one." There are two kinds of death in the Bible, physical and spiritual. We inherited both types of death from Adam. Adam's sin brought physical and spiritual death to all. Romans 5:12 "Wherefore, as by one man sin entered into the world, and death by sin; and so death passed upon all men, for that all have sinned." 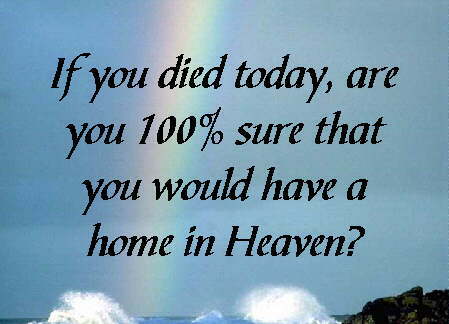 So, because of sin, we must die a second death eternally in Hell, unless we find another way to pay for our sin. Revelation 21:8 tells of "the lake which burneth with fire and brimstone: which is the second death." Jesus paid the entire price for you by His death on the cross. A Holy and Just God set the price on sin, and then in love, paid the price for sin Himself in the person of Christ. Romans 5:8 "But God commendeth his love toward us, in that, while we were yet sinners, Christ died for us." He bought eternal life for all. Jesus owns and freely gives eternal life. In fact, He promises that: "�him that cometh to me I will in no wise cast out." John 6:37. We are saved from the second death by a living Savior! Christ is alive today! Romans 6:9 wonderfully says: "Knowing that Christ being raised from the dead dieth no more; death hath no more dominion over him." He has power and victory over death and sin and thereby offers the same to you as a gift, not a reward. This is a promise. The word "whosoever" means you. Not�whosoever is a church member, or is baptized, or is confirmed, or takes communion, or does the best he can; but whosoever shall call, believing in Jesus. The word believe means to trust, to depend on to rely on. To believe on the Lord Jesus Christ means that you accept the fact that you are a sinner, that as a sinner you owe the sin penalty, and that Jesus Christ died on the cross to pay the debt you owe. But it means going one step further. It means that you will completely trust Christ to get you to Heaven; that you will put the matter of your salvation in His hands and depend on Him for everlasting life. John 1:12 says: "But as many as received him, to them gave he power to become the sons of God, even to them that believe on his name:" John 5:24 says: "Verily, Verily, I say unto you, He that heareth my word and believeth on him that sent me, hath everlasting life, and shall not come into condemnation; but is passed from death unto life."